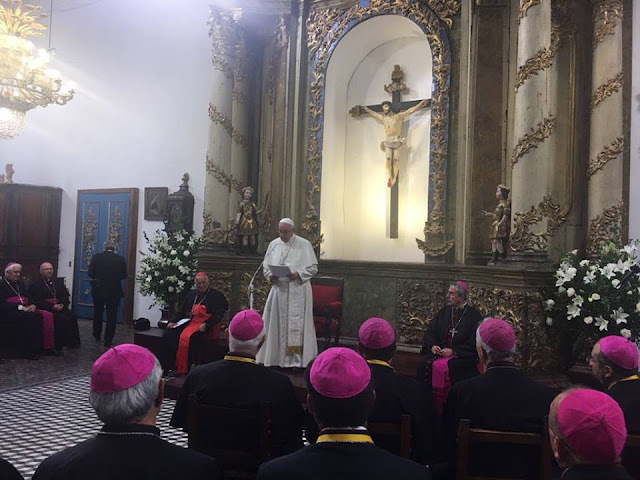 On the first full day of his apostolic journey to Chile, Pope Francis met with the Bishops of the nation in the Sacresty of Santiago Cathedral. And in this regard, to beg, to implore from the Holy Spirit the gift of dreaming and working for a missionary and prophetic option capable of transforming everything, so that our customs, ways of doing things, times and schedules, language and ecclesial structures can be suitably channelled for the evangelization of Chile rather than for ecclesiastical self-preservation. Let us not be afraid to strip ourselves of everything that separates us from the missionary mandate. Dear brothers, let us commend ourselves to loving protection of Mary, Mother of Chile. Let us pray together for our presbyterates and for our consecrated men and women. Let us pray for God’s holy and faithful people.